On Broad Street, behind the famous stone heads on pillars opposite Blackwell's bookshop, is the Museum of the History of Science. This was the old Ashmolean Museum, built to house the collection of Elias Ashmole and opened in 1683. Elias had by somewhat underhand means come into the possession of the "natural curiosities" of John Tradescant the younger. His father, John Tradescant the elder, was head gardener to Charles I and had travelled the known world collecting plants and unusual objects of interest. The Tradescant curiosities formed the core of Ashmole's collection. In addition to displaying objects, the old Ashmolean was the first scientific institution in England, containing a library, a chemical laboratory, and a dissecting room. Lectures were also given. The Museum of the History of Science draws together many of the strands of Oxford science that we have encountered on our walk. You can see the original penicillin apparatus, a print commemorating James Sadler and a medallion struck in his honour, a portrait of Sir Henry Savile, Hooke's drawings of fleas as observed by him under a microscope, a Victorian replica of the Hooke-Boyle air pump and a small component part of the original, a portrait of Halley, and a colourful painting of a dodo. The museum also houses early chemical apparatus, watches and clocks, medical instruments, and the finest collection of European and Islamic astrolabes in the world. These were medieval instruments used for making astronomical measurements. The only complete spherical astrolabe known to have survived is in the museum's collection. Henry Mosely, the atomic physicist, lived and worked in Oxford before the First World War. Moseley was the first to determine the atomic numbers of some elements in a series of brilliant experiments. 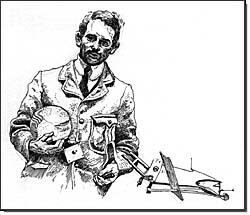 He was killed at Gallipolli in 1915 and is pictured above holding some of his apparatus. In the basement of the Museum is the blackboard used by Albert Einstein in the second of three Rhodes Memorial Lectures on the theory of relativity he delivered at Rhodes House, Oxford, in May 1931. These lectures were given at an exciting time in physics. The application of new solutions of Einstein's field equations to the actual universe became possible by Edwin Hubble's discovery in 1929 that shifts towards the red of the spectral lines emitted by distant galaxies (the so-called "red shifts") were directly proportional to their distance from the observer. This discovery was generally taken to indicate the expansion of the universe as a whole. The relation between this expansion and the mean density of the universe formed the subject of the second of Einstein's lectures, delivered on 16 May 1931. 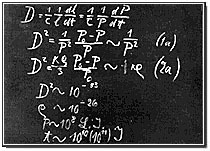 In the first three lines on the blackboard, Einstein derives an expression for D, the coefficient of expansion of the universe, in terms of rho, the density of matter in the universe. The last four lines give numerical values for the expansion D, the density rho, the radius P, and the age t of the universe. LJ denotes Licht-Jahr, or light-year, and J denotes Jahr, or year. A value for the age of the universe of 10 (or 100) billion years compares with the modern-day estimate of around 15 billion years.